If you are looking for a summer holiday with a difference this year, then you really should put Iceland on your consideration list. With so much to see and experience, the Nordic island is less than a 3 hour flight from the UK, making it perfect for a short haul holiday destination. The average temperature in August is a cool 13 (55F) degrees Celsius, with lows of 8 (47F) degrees Celsius, so you may still need to pack a few jumpers, but who needs to worry about the temperature when you are visiting such an amazing country! Don’t expect a holiday in Iceland to be sedentary, there really is so much to see and do during your time there – with many amazing photo opportunities to be had! 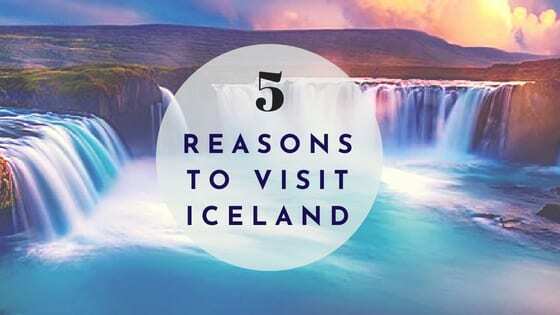 Here are some reasons why ‘Visit Iceland‘ needs to be on your bucket list! One of the most visited attractions in Iceland, the Blue Lagoon is a geothermal spa and can be found in a lava field in Grindavik, on the south-western Reykjanes Peninsula, less than an hour’s drive away from the capital city Reykjavík. Enjoy a bathe in balmy waters that average 37-39 degrees Celsius at the man made lagoon, where water is renewed every two days. With a rich mineral content, it is reported that visiting the lagoon can help aid skin conditions – whilst the minerals are the reason behind the gorgeous milky blue colouring of the water. Iceland Fact: The majority of Icelandic folk believe in elves, including Iceland’s most famous export Bjork. When you think of Iceland, geysers such as one of Iceland’s most famous ‘Strokkur’ may spring to mind. The natural geyser erupts every 6- 10 minutes and is another of the islands most visited attractions. Encompassed in the Golden Circle, one of the most popular tourist routes in Iceland, the area covering roughly 300km features geyserys such as Strokkur and Geysir (which no lays dormant), the Þingvellir National Park and the Gullfoss Waterfall are all highlights on this tour to the South of the island. With well maintained roads, this is a tour you can drive yourself or take a tour, generally this will take a full day to fully appreciate and take in the atmosphere of Iceland’s beauty spots. With its breathtaking views, a walk around the truly beautiful Þingvellir National Park is a must see. With a strong cultural heritage, the park was chosen by the Viking’s back in the 10th Century to be the home of their meeting place, Althingi – making it the world’s oldest parliament. Don’t forget to pack your rain mac for a tour around the Golden Circle, the iconic Gullfoss Waterfall cascades from the Langjökull glacier and is a true display of nature’s raw power! Iceland Fact: The island does not have any McDonald’s restaurants. Did you know that glaciers cover over 11% of the land area in Iceland? They are so spectacular that they can even be seen from space! Glaciers are defined as a mountain where the snow and ice never melts. There are many glaciers to see on your trip to Iceland, including one of Europe’s largest glaciers Vatnajökull located to the South East of the island. Glacier tours in Iceland allow you to hike the ice caps with the proper equipment and a qualified guide whilst taking in the amazing sights and ice formations on offer. Iceland Fact: You will never be bitten by mosquitoes in Iceland, as there aren’t any so no need to pack any repellent! The capital city of Iceland, located to the South West of the Island, is the mainstay for tourists who visit Iceland and for many good reasons. The city is a hive of activity, culture and is popular for the nightlife. The total population of Reykjavík is just over 123,000 and is widely renowned as one of the cleanest, safest and greenest cities in the world. Home to a wide variety of museums, prepare to be completely inspired by your stay in Reykjavík. If you want to fully immerse yourself into the Nordic culture, then a visit to the Viking Saga Museum is a must! Iceland Fact: Iceland does not have its own national army. A trip here would not be complete without witnessing the dazzling sights of the Northern Lights – also known as Aurora Borealis! Show stopping coloured lights of green, pink and violet dance across the sky majestically like a celestial ballet. Although not guaranteed, Iceland’s location makes it extremely favourable to view the phenomenal night time experience. November through to March are the best times to properly view the spectacular Northern Lights, but wrap up warm, the temperature will be cold as the ideal temperature for viewings is zero degrees! If I haven’t sold you on a trip to Iceland, I’ve certainly sold myself! It is the perfect destination for those looking for a more adventurous and activity based holiday that will make memories for a lifetime! I have seen so many pictures of the blue lagoon! I would absolutely love to go!